సా మాం పాతు సరస్వతి భగవతి నిఃశ్శేషజాడ్యాపహా. 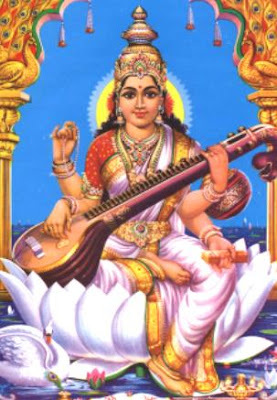 May that Goddess - Bhagavathi - the blessed Saraswathi presiding deity of learning and remover of our lethargy, laziness and ignorance, protect us. She is pure and white like the jasmine, the full moon and the garland like formation of dewdrops. She is dressed in a spotless robe. She has in her hand, the auspicious instrument veena. She is seated on a white lotus. She is the one who is always respected by Brahma the creator, Vishnu the preserver, Shankara the annihilator and other Gods. Hai sailaja,very nice idea .keep going ,all thr best. hi sailaja,so nice keep going.